Varca Beach, Goa so beautiful and picturesque, Varca Beach lies about 2 kms South of the more known Benaulim Beach. It has a special tranquility and relative seclusion as it’s not very well known among travelers, which actually makes it more attractive to those who love it for being solitude. Varca Beach offers you long walks of warm, golden silence. It seem even the waves whispers around Varca – so typical to Goa is the ambiance around this place. 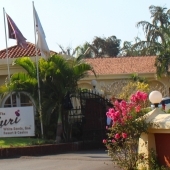 As for Hotels at Varca Beach Goa, you have the famous 5-star hotel – Renaissance Resort, the Club Mahindra Resorts, Goa Beach House... You could still enjoy the hospitality of a family run beach resort and restaurants around the beach itself, just like anywhere else in Goa. Varca Beach is located about 50 kms away from Dabolim airport, and about 18 kms from Margao railway station, and 35 kms from Palolem Beach. The main attraction while you are visiting Varca Beach, besides the obvious swimming and sun-bathing, is a wide scope for water sports and sailing to watch dolphins and the amazing marine life, you can also learn yoga, or check on River San adjacent to the Bay. Some great beaches in its vicinity are the famous Colva Beach, Cavelossim beach and Mobor beach.